The Holidays are a time to enjoy family, friends, make memories, keep up with family traditions and (da da da da)… eat, drink and be merry! I’ve often heard over the years that many people gain 5-10 pounds between Halloween and Christmas. While recent studies have debunked the 5-10 pounds, research has shown that weight that is gained during the holidays often stays on – the unwanted gift that keeps on giving. According to the Academy of Nutrition and Dietetics, Americans gain approximately one to two pounds during the holiday season. But if that weight is going to stay and you add up one or two pounds over 10 years that is a 10-20 pound weight gain (that likely will be much more difficult to lose). Interestingly, in a consumer reports survey on what Americans dread most about the holidays (conducted in 2011), holiday weight gain tied for second place (along with going into debt ); both at 37%. Not only is it something that we know can happen, it also plays a big role in adding to an already stressful season. What can you do? The good news is that you CAN actually enjoy your favorite foods and beverages and not gain weight. Here are a few tips to help! In preparation for a big holiday party or feast, do not skip meals throughout the day; no you really can’t save up all your calories for one meal. Although it would be nice at times, our metabolism doesn’t work this way. How many times has your mother told you not to skip breakfast? Turns out, she was right. Research has shown that people who consume a morning meal tend to consume fewer calories throughout the day. Also include a lot of fruit, vegetables and whole grains. Fiber rich foods are high in volume and will satisfy your hunger. They are also lower in calories. But don’t fall for the idea that eating very large portions of perceived healthy foods won’t catch up with you. Enjoy foods, but keep moderation in perspective. Most of our holiday meals or parties are buffet style or large meals. The good news is that there are many ways you can help yourself moderate portions – start by using a smaller plate. Fill your plate with veggies and eat a salad before you eat the main meal – this will help you eat fewer calories. If you practice eating in moderation, guess what? You can include dessert or that goodie you’ve waited all year long for (that would be fudge, for me). Be mindful when you are eating. Many people tend to be emotional eaters and the holidays bring about lots of emotions; happy or sad. And one of the most important things to remember is to eat slowly; savor those favorite foods. Pay attention to whether or not you are actually hungry; and one of the tips I use most often is eat until you are satisfied, NOT FULL. Your brain and your stomach take 10-20 minutes to communicate. By the time you are full; you may actually be stuffed. If you do feel like you are hungry for second helpings, go for the non-starchy veggies that pack a punch with vitamins, minerals and fiber. Stay hydrated. Many times our thirst cues are mistaken for hunger cues. Aim for at least 48 ounces of water daily. And last, but certainly not least – MOVE! Physical activity is one of the best things you can do to stay healthy both physically and emotionally. Go for a walk after dinner – it’s a great time to catch up with family or friends, get some fresh air and help work off those extra calories. And if you can’t go for a walk, there are lots of fun YouTube videos the whole family can enjoy. You might all enjoy (or at least get a laugh) by doing the “go chicken fat go” exercises. There are both chair and standing videos to watch! Happy Holidays all and cheers to a healthy you! 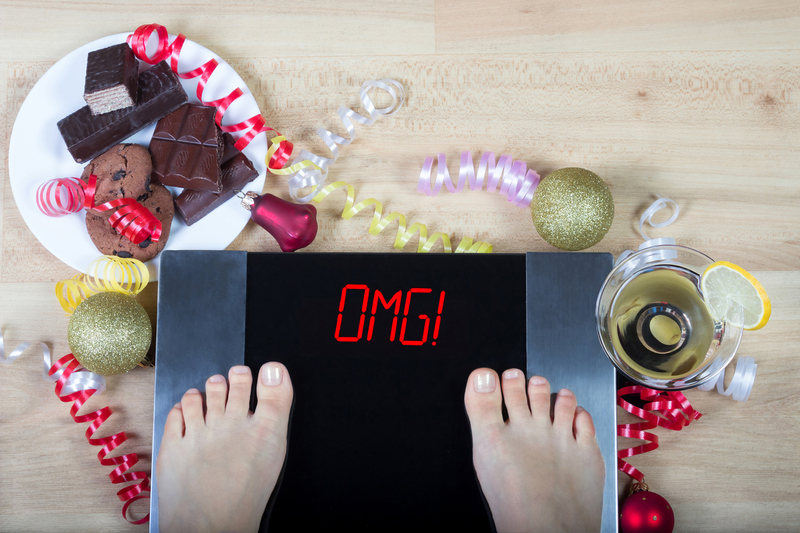 Holiday weight gain: The unwanted, unhealthy, un-returnable gift that keeps on giving. Health and Wellness Monthly. Retrieved 12/14/2017, from www.letstalknutrition.com. Sugar is 8 times more addictive than Heroin. The struggle is real. Drink water, eat nuts. Make the holidays about the PEOPLE and the MEMORIES, NOT about the food. I used to be an “emotional eater” but found the Code Red Lifestyle at my turning point last January. I have lost 95 pounds since then and I’m not a paid actor. Do your own research people. High quality FAT and Fiber will Fuel your body and keep you full. When they took our fat out in the 80″s it tasted horrible and so they added sugar and chemicals. Why are 2/3 of our country overweight? We will NOT have a military or 1st responders this next generation if we do not change our diet.